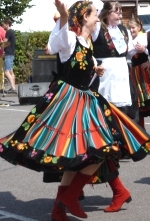 This site covers the dance activities of our Bognor Regis club which is an associated group of the Society for International Folk Dancing (SIFD) and of the Sussex Folk Association (SusFA). The class is open to all and no previous dancing experience is necessary. We have an amateur display team that tour a selection of village fetes in West Sussex in the summer, dancing in various regional costumes. In the past the display team appeared at the Llangollen International Eisteddfod, and formed part of the Society for International Folk Dancing (SIFD) group appearing in the CCPR Show at the Royal Albert Hall. We were involved in organising the Eastbourne International Folk Dance Festival over the border in East Sussex on behalf of the Society for International Folk Dancing (SIFD)for several years. Janet also teaches at the Gosport & Fareham Interfolk in Hampshire. She calls and dances at the Felpham and Middleton Country Dance Club. As a result of our activities we have friends all over England and the UK and throughout Europe. Janet has been the editor of the SIFD News for fifteen years. We are always happy to have children to join in our Monday class. They don't have to join the display team and can be complete beginners. The emphasis is on learning to enjoy dance not passing exams! We are looking for more adults to join our display team for next year. You do not need a partner or any special expertise. There is more than a year to practice - you need only to live locally enough to come. If you just want to dance but not be in the display team, that is fine. We are always pleased to welcome new people. If you have read this far you must be interested in us! Use the BRIDE links on the left to find out more about us.